• Work your walls with ideas that max out underused vertical space, increase storage and add display perches. • Marvel at how two roommates in D.C.’s coveted Dupont Circle neighborhood personalized their 1890’s rental with budget-friendly vintage finds. • Take note of how inventive design and multi-functional furnishings transformed a 650-square foot NYC apartment into a home/workspace with abundant natural light and ample hidden storage for a couple that works and plays together. 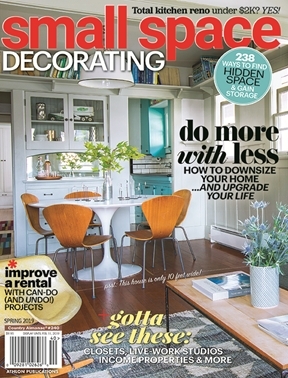 • Learn from the architect who crafted a streamlined, storage-filled home from a 10-foot wide cottage (that’s his home on the cover!). Plus, discover how multitasking furnishings can make your life easier and update a room with paints, patterns and fresh finishes with our can-do makeovers.